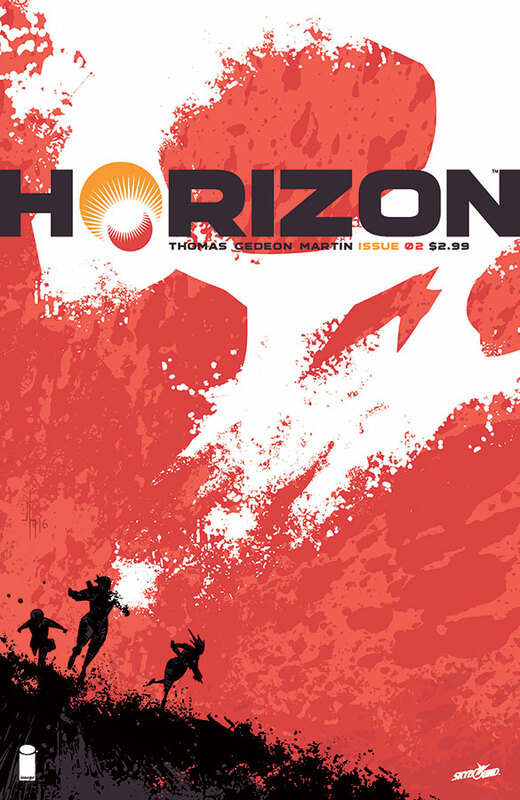 'Horizon' continues to evolve and issue two opens up the narrative big time as it becomes an action-packed rescue mission providing some needed context to what the hell is going on. The first issue quietly introduced us to Zhia who was sent to earth to help stop the invaders of her home planet Valius. The enemy is us and with issue two we learn she's not alone but in command of her own platoon. They have their sights set on rescuing of their own who's been captured. If things weren't exactly clear after the first issue then this one definitely defines and raises the stakes. Brandon Thomas has a great concept that he's unfolding slowly with just enough action and chemistry among his characters to keep things compelling. Thomas' script is perfectly matched with Juan Gedeon's art style. It's wild frenetic lines with minimal detail and adroitly choreographed fighting scenes moves things along with a ton of force and technique. His character designs are unique and visually arresting. Frank Martin adds some electric colors to accentuate Zhia and her team's weaponry but more subtle tones elsewhere. The book doesn't look like any other and that's a good thing. 'Horizon' is slowly opening up the story with some provocative twists making us the bad guys and the aliens the freedom fighters. Considering the awful things we do to each other it's not far-fetched we'd invade another planet if we could. Thomas and Gedeon are still finding their footing but so far it's coming together, building momentum and looking great while doing it. 'Horizon' is still one comic to watch.